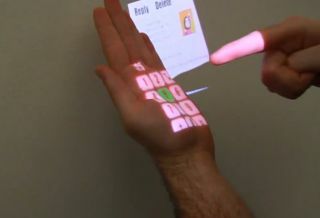 Microsoft Research and Carnegie Mellon University have unveiled a new project that uses Kinect and a projector to turn any surface into an interactive touch screen. The project, dubbed OmniTouch, will track surfaces such as the palm of a hand, and lets users use taps and multitouch gestures to interact with them. The project consists of a shoulder-mounted Kinect camera coupled with a Pico projector to recognise surfaces, and project interfaces on to them. The surface can even be moved around, for example on a user's wrist, or expanded onto nearby flat surfaces. In an example sequence, the user is alerted to a new email on the palm of their hand. "Rather than viewing the message on the small confines of the hand, the user instead approaches a nearby wall, and selects a region for the email to appear," says Chris Harrison, one of OmniTouch's researchers. The project is obviously in its nascent stages, but it could lead to some pretty nifty applications, like being able to play a real-time strategy on the surfaces of your kitchen, or trying out a tattoo design to see how long it'll be before you face the inevitable pangs of regret and self-loathing.